At least 55 people were killed in triple suicide bombings that targeted mosques attended by Shiite Huthi militiamen in the Yemeni capital, medics said. Dozens more were wounded in the bombings, which targeted Badr mosque in southern Sanaa and Al-Hashahush mosque in the northern Jarraf neighbourhood. One bomb exploded inside Badr mosque and was followed by another at the gate as worshippers fled, witnesses said. The Huthi militia’s Al-Massira television said hospitals in the capital had made urgent appeals for blood donations. The attacks are the deadliest since a car bomb killed 40 people and wounded dozens more at a police academy in Sanaa in January as recruits lined up to register. 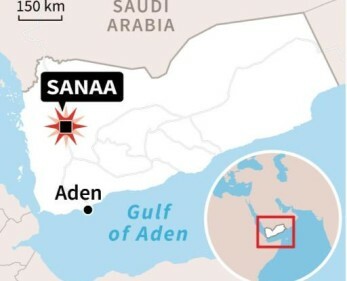 Yemen’s top security body blamed Al-Qaeda for that blast although a leader of the jihadist network denied responsibility. President Abedrabbo Mansour Hadi escaped Huthi house arrest in Sanaa last month and fled to the southern city of Aden.